Look like you just spent a weekend in the sun with Terracotta Joli Teint Natural Healthy Glow Powder Duo! 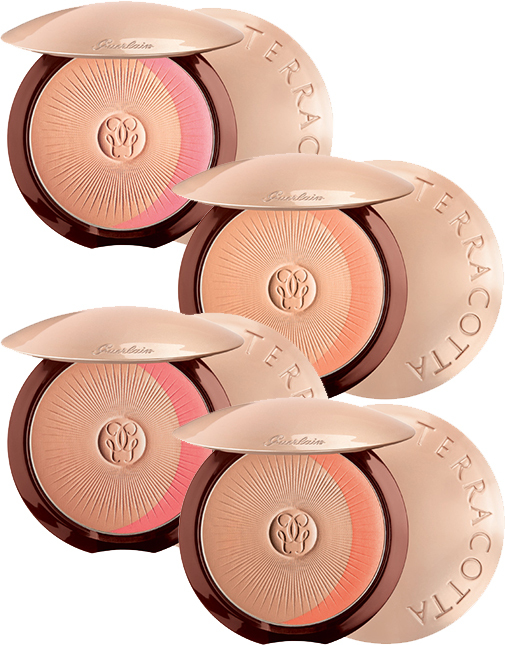 Guerlain Terracotta Joli Teint Natural Healthy Glow Powder Duo - $60 - achieve the look of 3 days of sun in just 3 seconds with one of the 4 universal shades that compliment fair to medium complexions - with one color to warm-up the skin tone and another one to bring a refreshing flush - together they give you that perfect natural healthy glow! I like that the blushing colour is off to the side in the palette making it much easier to get at the shades separately with a brush - use the bronzer shade on any place the sun would naturally hit - nose, forehead, chin and cheekbones and then use the colour shade on the apples of the cheek for a healthy looking pop of colour - an easy way to fake warm weather until we finally get it!